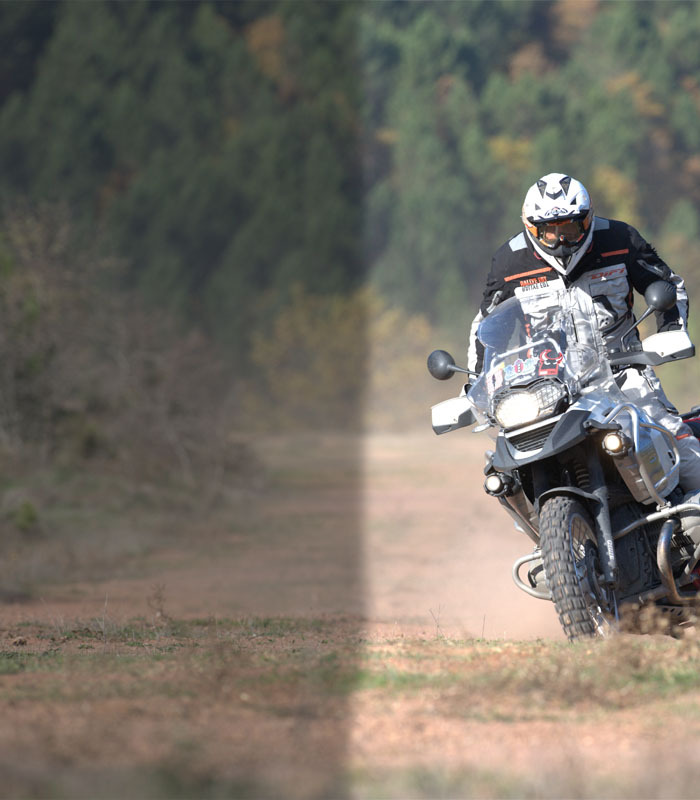 Adventure riders are, after all, a self-reliant bunch that are hands on with their bikes, be it an off road repair or general home maintenance. 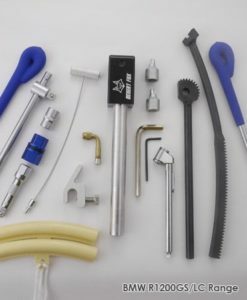 There are many tools out there-but how does a rider choose the correct quality and type of tool and not pay for tools you’ll never use? 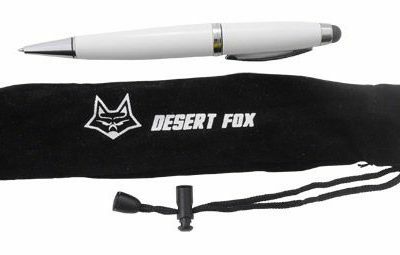 The Desert Fox range of motorcycle tools we believe addresses these issues with robust, model specific bike tools born from necessity and not gadgetry. Only the tools you need, and none you do not. Do the components meet or exceed international standards? How do the components perform in ACTUAL use in respect of safety and usability? How are these components manufactured and what materials are used in their construction? Is the person who designed the product involved in making the product? The more steps a company has under its control the better a product will be. Outsourcing doesn’t produce a bad product when the people making the product don’t care. It makes an inferior product when the people who understand the intent behind the product are separated from its execution. Top-grade industrial quality for rugged use. High bending strength – tools do not fracture or splinter when overloaded, therefore posing a lower risk of injury to the user. Strict production tolerances ensure a perfect fit on bolts. Ergonomic profiles without sharp edges. How do the components perform in ACTUAL use? 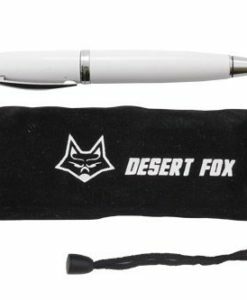 The Desert Fox Ratchet handle is arguably one of the most robust on the market. 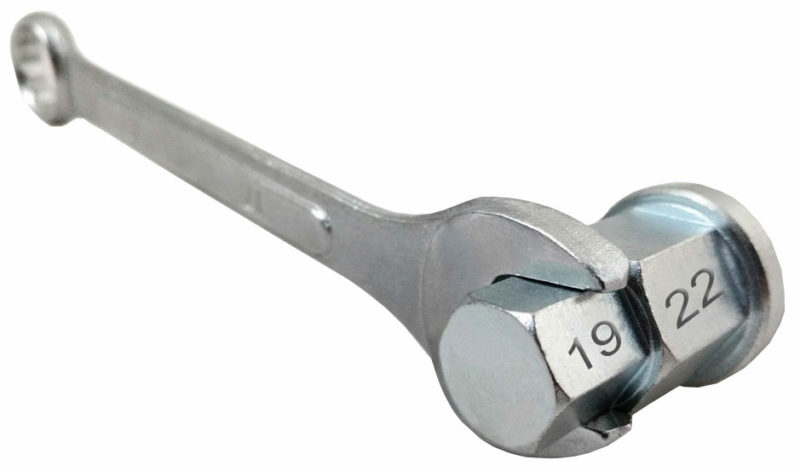 Most ratchet handles suffer from premature gear tooth failure, often as a result of too much torque being applied when the ratchet is in the locked position. When most ratchet handles are locked the pawl is pushed against one tooth in the gear, with that tooth having to withstand the force applied to it. 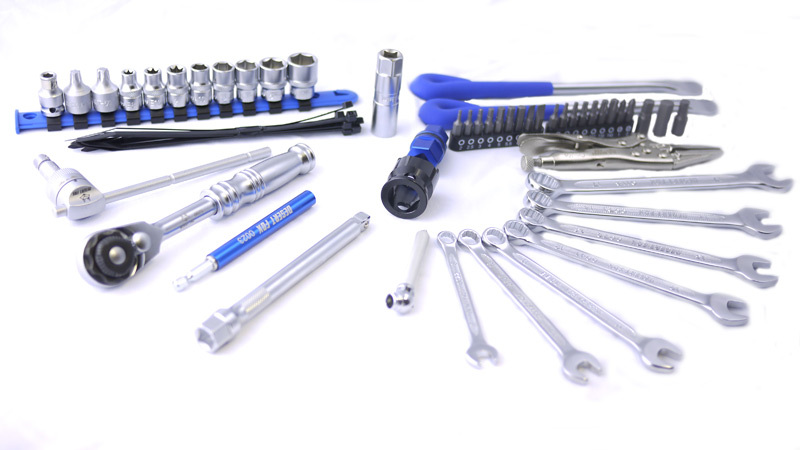 Typical applications of a lock position ratchet would be when loosening the rear wheel nut. Considerable force is placed on the ratchet gear in such instances. 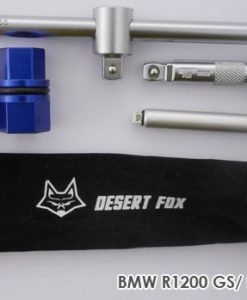 The Desert Fox ratchet handle does not lock on one tooth of the gear but rather directly to the hexagon body so that any torque is direct to the socket, not the gear, resulting in a long lasting ratchet handle as well as reduced rounded nut heads and bloody knuckles. In tests conducted conventional ratchet wrench gears failed after +- 2200 “swings” due to forces not being evenly distributed – pressure is invariably applied in one direction i.e. 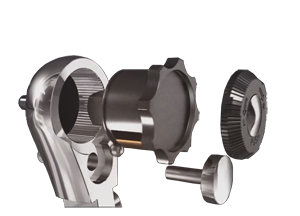 only one pawl in the gear system carries the load when either tightening or loosening. The Desert Fox gear was not affected after 5000 “swings” as the forces are evenly distributed. The inner gear mechanism contained in the ratchet head is hidden from view and easy to ignore. These gears however have a distinct bearing on longevity and convenience. As a result the tooth count of these inner gears is an important consideration. Common tooth counts include 36, 40, 45, 60 and 72. The Desert Fox  3/8” ratchet drive is 72 tooth. 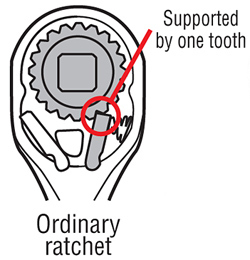 The higher the tooth count, the smaller the space required to work in as the ratchet has a shorter back swing (fewer degrees of rotation) to move one click. 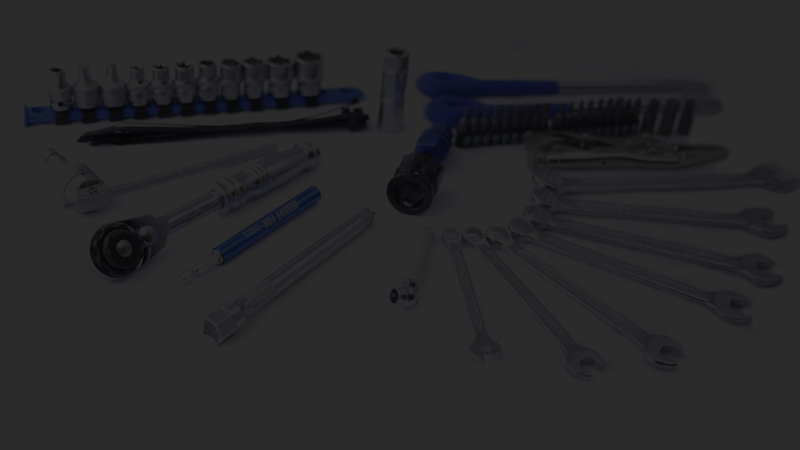 72 tooth ratchets also have less internal resistance, they’re less likely to unscrew a loose nut or bolt on the return stroke. All Desert Fox sockets have a Flank traction system for an enhanced torque transmission. This wave form (with no sharp edges) found within the socket ensures there is an enlarged contact surface. The benefits of this traction system are a safe & consistent torque transfer which is applied to the full face of the bolt head or nut, rather than just the corners. 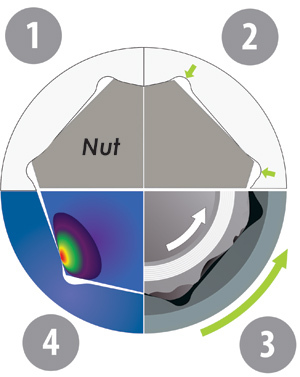 In instances where there is already damage to the nut the Flank traction system assists in loosening damaged nut heads. 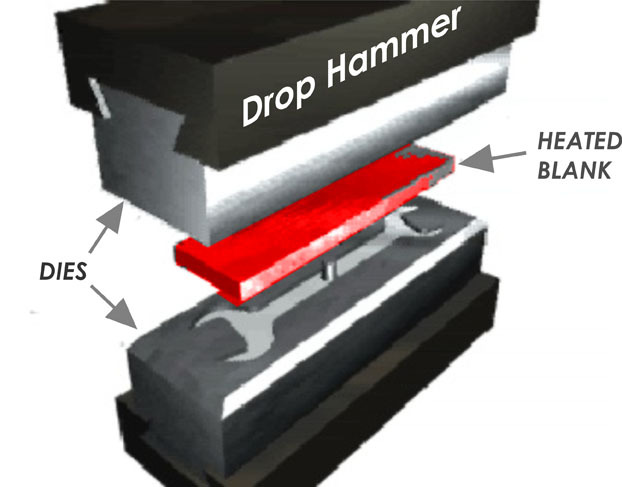 The Flank traction system ensures a larger contact surface area for a safe grip, even on bolt heads whose dimensions do not conform with Din standards. 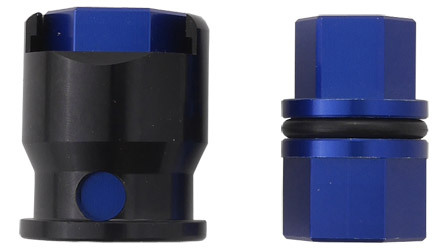 No sharp edges prevent damage to the bolt head profile and reduces slippage. Optimum distribution of force enables a higher torque value. A smaller contact surface area reduces grip compromising efficient and safe torque transfer. Sharp edges increase the stress to the bolt head which can destroy the profile. 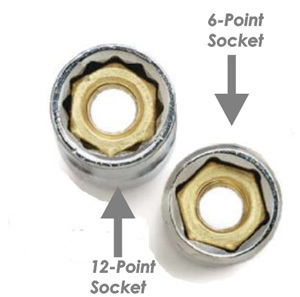 Worn bolt heads cannot be released as the torque is no longer transferred and the socket starts to slip. Strong forces are exerted on the tip of the bolt head profile only. This concentrated pressure deforms the bolt head. A 12-point socket has the advantage of allowing more angles at which you can get your socket onto a bolt, but at the cost of decreased durability due to less point contact . As a result  they are more prone to stripping & rounding bolt heads. Such sockets also have the disadvantage of having a thinner wall structure. 6-point sockets are more robust as they spread the load on the bolt head more efficiently ,striping bolts less. Such sockets also have thicker wall allowing for greater torque transmission. All Desert Fox sockets are 6 point and coupled with the 72 tooth ratchet handle  and the 15 degree wobble extension will allow for placement of the socket in the tightest of areas. How are these components manufactured ? All Desert Fox spanners are made from forged blanks. The blank is heated to an exact pre-selected temperature entering the forge while still red hot. The steel is given its form under the multi-ton blows of a drop hammer. This high-specification precision drop forging ensures a uniform steel grain structure which provides optimum strength. The jaws are broached to size, using exacting tolerances for exceptional accuracy. Spanners are ground and polished before being heat-treated within rigid controls for consistent and reliable strength. Using a special thermal treatment achieves maximum hardness – and a guarantee of long service life. Any corners and edges still remaining are smoothed off by vibratory grinding, until the heads and shaft are absolutely free of burrs. The spanners are polished again before the final process of computer controlled matt nickel chrome plating, for maximum resistance to corrosion. 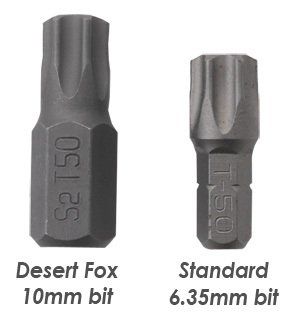 All Desert Fox sockets and accessories are drop forged from high grade materials to precise tolerances. The Flank drive is machined to exceptional accuracy within strict controls before precise heat treatment, offering durable, reliable and lengthy service. Drive sockets and accessories are finally nickel-chrome plated and then polished to a matt satin finish for optimal corrosion resistance. Why Matt Nickel Chrome Plating? Non-slip surface for a firm grip even when hands are dirty. 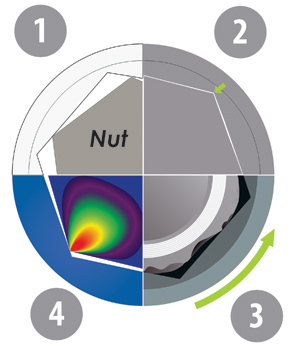 Twice the protection against corrosion: A nickel layer is applied before chrome-plating and these two layers combine to form an optimal protection. Chrome chips are practically unheard of on matt satin nickel chrome-plated tools. What materials are used in their construction? 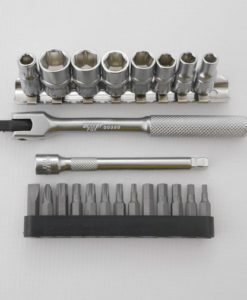 The material a spanner or socket is made of significantly affects the quality of the tool. Tools made from steel with a percentage of chrome vanadium offer one of the ideal mediums for hand tools – if constituted correctly. Chrome vanadium is formed by combining different alloys in specific proportions. The percentage of each constituent component is based on characteristics sought from the finished product. Different steels have different edge holding capabilities. Chrome is a very hard metal and adds hardness to steel. Vanadium is a brittle metal adding toughness. The nett result, if correctly formulated, is a steel that holds an edge but doesn’t go dull after repeated use. The mention of Chromium vanadium steel does not however constitute a sufficient guarantee of quality. 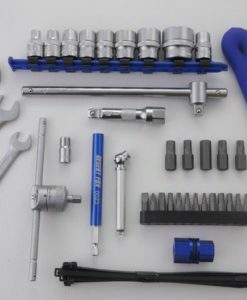 It is important that the blend of Chrome vanadium used in tools meets international standards such as DIN. All Desert Fox Chromium-vanadium spanners and sockets fulfil the requirements of these standards. Desert Fox opted for this unique item (as opposed to a conventional screwdriver type bit holder) as it reaches areas where screwdrivers cannot be used. It also saves weight and space. 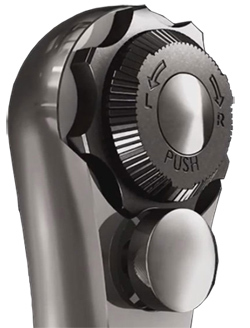 A multi-positional drive head (simply slide it on the T-bar) ensures it can be used in confined spaces while a knurled collar requires only a finger to select reverse, forward or full lock . 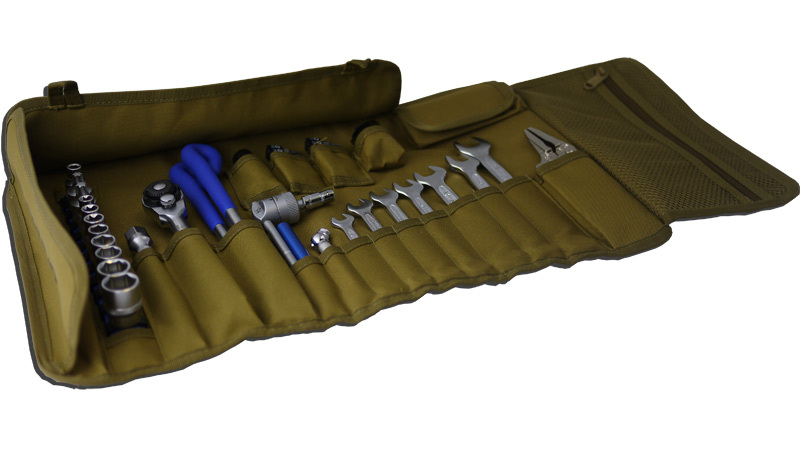 The magnetic adjustable bit holder has been designed for working in tight spots with confidence. 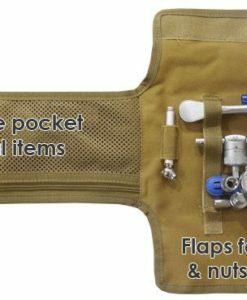 Simply click it onto the ¼ “ T-bar ratchet and its integrated magnet and extendable shroud holds a screw in place, useful in areas where your fingers cannot reach. A ¼” / 6.35mm bit ( hex or torx drive) has a maximum safe torque limit. Exceed this torque limit and the bit will shatter. 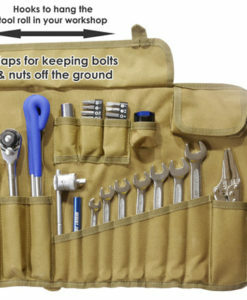 Yet some tool kits supply ¼” bits that are expected to drive torx or hex bolts larger than the bit’s ¼” diameter. Using a BMW GS 1200 rear wheel as an example you have probably long forgotten the last time you rode in rain or crossed a river. Until it comes to removing the wheel. Chances are the wheels torx bolts have corroded or have been over-tightened in the past. Consider that a torx T40 bit is ¼” (6.35mm) in diameter and has a maximum torque range of 54-65 N.m. The rear wheel bolts of a GS 1200 are torx T50 with a maximum torque range of 132-158 N.m.
And you are expected to safely loosen a T50 bolt with 6.35mm bit? As a result, any Desert Fox bit that exceeds ¼”(6.35mm) in diameter is supplied as a 10mm diameter bit that is driven by an included  3/8* driver. 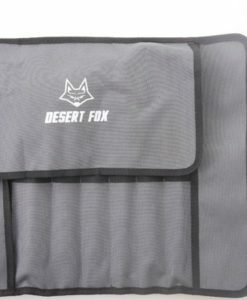 All Desert Fox bits are manufactured from S2 steel which is harder than chrome vanadium or 8650 steel, commonly used for most bits. For your safety and to ensure that the tool meets torque requirements and will not let you down when you need it most. The Desert Fox 19 and 22mm combination axle tool has been CNC machined from 776 T6 Aircraft grade aluminium to save weight. It also incorporates a 3/8” drive for precise torque transmission. 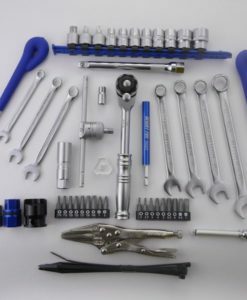 Conventional axle tools are made from steel and have no provision for a 3/8” drive necessitating that an additional 2 spanners are required to use it. Before you can remove and replace the spark plug on a BMW motor you need to remove the coil on top of the spark plug. For good reasons, the coil should not be removed with pliers or similarly crude tools as it is easily damaged, preventing you from continuing your journey and a costly exercise to remedy. This tool simplifies removal of the spark plug coil on R, F, G and K Series coil-over bikes. CNC machined from aluminium to save weight, it will not damage the coil or wear out, ensuring safe coil removal. To save space the 19/22mm axel tool (above) integrates neatly into the coil puller. The included tyre pressure gauge has been purposely designed for motorcycle with a large easy to read scale up to 350kpa (3.5 Bar). Motorcycle tyres do not need to be inflated beyond 350kpa. Conventional gauges have scales up to 800 kpa (8.0 Bar) on the same surface area, making the scale very difficult to read accurately. approach when attempting to tighten and loosen bolts in deep, difficult to access spaces. 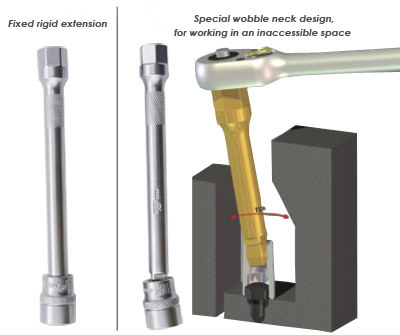 When the wobble function is not required simply push the socket deeper and the bar becomes a fixed rigid extension. Manufactured from Chrome-vanadium steel with an Anti-Slip handle that has no sharp edges, for additional comfort and safety. Purposely designed with a wide spoon design to prevent accidental tube pinching .